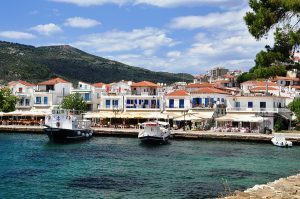 Located about 45 miles off of the eastern coast of the Greek mainland, Skiathos, is a lovely island to include on a crewed yacht charter of the Greek Sporadic Islands. The island has over 60 beaches and several of these fine sand beaches and the Old Port were set locations for scenes filmed for the recently released movie, “Mama Mia”. A very rich green island, Skiathos should not be missed while on a crewed yacht charter of the Sporadic Islands of Greece. 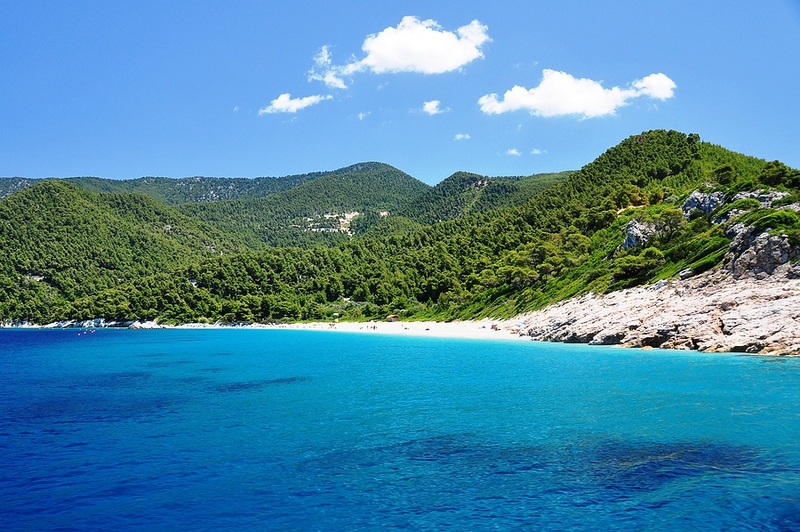 Even though the island of Skiathos is quite small in size, it is a popular island to visit due to the natural green beauty and the many beaches all with very fine sand. 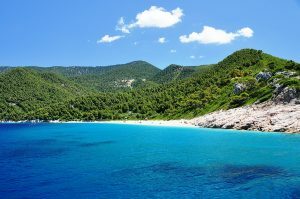 Around the island, and included in the municipality of Skiathos are the islands of Tsougria and Tsougriaki, and the islets of Bourski, Maragos, Arkos, Troulonisi and Aspronisi. All of these little islands and islets offer many secluded anchorages to visit and enjoy during a yacht charter cruise of the area. 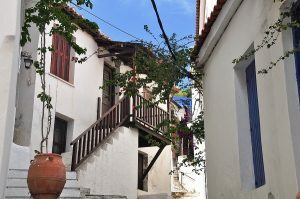 The Old Port, or the town of Skiathos was the original settlement on the island, although during more tumultuous periods in centuries past, the main town was relocated to Kasto, at the top of a large promontory which offered a safer haven for the villagers, during the age of piracy. 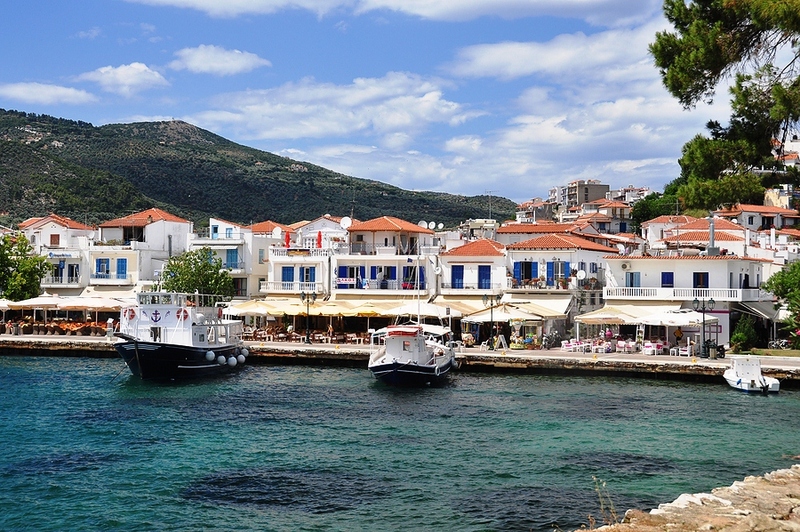 In the 1800’s after the War of Independence and the demise of piracy, the main town on the island of Skiathos was moved back to the Old Port. Kasto still remains as a village, however is still quite protected, with no roads leading into town. The only way to access Kasto is on your own two feet with a 30 – 40 minute hike on the village trail or by the same village trail riding on the back of a donkey. 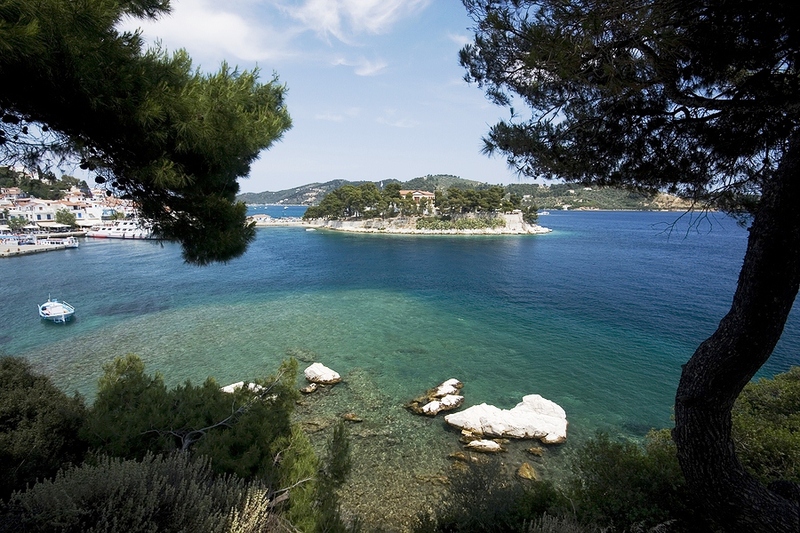 Skiathos is a beach island with verdant green pine forests covering the landscape up to the fine sand beaches, which are all lapped by crystal clear blue green waters. There are anchorages all around the island, creating plenty of locations for great swimming and water sports. Along the northern side of Skiathos are tremendous rock formations and sea caves just waiting to be explored by ships tender. Skiathos is an island for relaxing, enjoying the lovely landscape, green pine forests, fine sandy beaches, clear water and local tavernas, for a slice of the slower side of life on a Greek Island while on your crewed yacht charter cruising in the Sporadic Islands of Greece.